← I’m worried. The kind where it is hard to sleep. 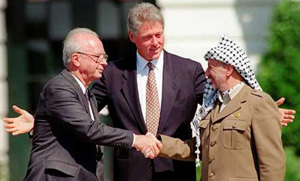 Yesterday marked 18 years since Yitzhak Rabin and Yasser Arafat met on the White House lawn and signed the Oslo Peace Agreement. 18 years. I remember this day and my own excitement of what this might mean for the Middle East. And 18 years later, I am sad. Sad that there is still no peace, that the vision espoused this day seems completely forgotten by everyone. I admit, I didn’t even realize it was 18 years until I heard a story on NPR. I don’t believe in using hindsight in regards to history. I don’t want to think about or pontificate about what might be. Rather I want to remember that feelings of hope, the anticipation of peace, and the desire to work towards that aim with true partners. This entry was posted in memories, Peace, Politics. Bookmark the permalink.